I recently discovered the IMDb Trivia iPhone app . I downloaded it to my iPod touch and began to play a few games. Each game is five levels and each level consists of five questions. There are five lives for any incorrect answers. If three questions in a row are answered correctly, a bonus round pops up. These questions are either ordering movies by release date or matching an actor to his movies by tapping moving bubbles. Answering these correctly earn extra points or an extra life. The application contains several packs to choose from. The pack determines the category of trivia received. The first pack is opened when you download the iPhone app . The second is unlocked when twenty five questions are answered correctly. The third pack is unlocked after scoring 100,000 points. The remaining two packs are available for purchase. Overall, this game is very entertaining. It is very easy to navigate the screens and questions. There is a good mixture of easy and hard trivia. I like earning other categories by unlocking them because it encourages me to keep playing. After each correct question, a trivia fact card is shown. I enjoy reading about movies and TV, so I appreciated this feature. The different style of questions presented is my favorite quality. There are typical ones with five multiple choice answers, but there are also pictures and movie posters on others. Sometimes movie posters need to be matched with character names. Other times a blurred picture is shown with five names. The name must be matched with the picture as the picture becomes clear. These features add to the uniqueness of the application . A few things could be improved. Each game presents twenty five questions. By my third game in the first category, I started receiving duplicate questions. Increasing the number of questions in each pack would increase my enjoyment of the game. Increasing the number of packs available would also be a plus. These are the only problems I encountered with this app . The free portions of IMDb Trivia are a good value since there are many positive aspects of this game. The packs for purchase may be a good value, depending on the number of questions available. If the number of questions in the stack could be known before purchasing, that would enable assessing the value more efficiently. These are easy fixes and I hope to see Playfield Apps make these small changes soon. 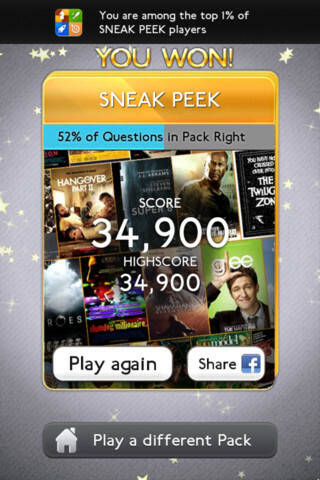 For those who love movie and TV trivia, I definitely recommend downloading this app to your iPhone, iPod touch , or iPad . It’s the perfect way to be entertained and escape for a moment. AppSafari review of IMDb Trivia was written by Darius Reimm on October 3rd, 2011 and categorized under App Store, Education, Free, Fun, Movies. Page viewed 6373 times, 3 so far today. Need help on using these apps? Please read the Help Page. I loved this app when I had my ipod touch, and then it broke. Would be great if it was available on the play store for android users.